The canyon of the Colca River is located about 100 miles (160 kilometers) northwest of Arequipa in Southern Peru. The Colca Canyon is one of the deepest canyons in the world at 10,725 ft (3,269 m), more than twice as deep as the Grand Canyon in Colorado. The surrounding Colca Valley is a colorful sucesión of Andean towns founded in Spanish colonial times and formerly inhabited by the Collaguas and the Cabanas. The local people still maintain ancestral traditions and continue to cultivate the pre-Inca stepped terraces. Attracting more and more visitors each year to the Colca Canyon, in addition to the awesome sights, are the Andean condors (Vultur gryphus), which can be spotted in its natural habitat at a fairly close range as they fly through the canyon. Our hotel selection in this area includes several options located in different villages, all excellent starting points for a visit to this beautiful and impressive area. This newly opened luxurious Orient Express lodge is located in the heart of the Colca Canyon, on the left bank of the river of the same name, and consists of twenty individual and spacious cottages or "casitas" dotted throughout the property, offering total privacy, beautiful views and the highest standard of comfort. Each double or twin cottage has been built with the beauty of the locality in mind, the emphasis having been placed on natural materials, with the walls made of brick and the roofs constructed of wood and handcrafted tiles. Beautiful “laja” stone floors are laid inside and outside complete with under floor heating. Each casita occupies and area of 120 sq. m., of which 80 is indoor space. A foyer leads to the bedroom and lounge area, with a sofa facing an open fireplace. Bathrooms feature indoor and outdoor showers and each casita has a private terrace and heated plunge pool. The Samay Spa offers a range of treatments inspired by the Andean culture, and created using indigenous products from the Colca Valley and the highlands of Peru. The main building on the property hosts the restaurant and lobby bar. Food for the restaurant is grown by the property's own farm, and the unique open plan kitchen allows guests to watch as the chefs prepare the meals. Activities such as relaxing in the swimming pool, horseback riding, walks, fishing in the lodge's pond, visiting the eco vegetable garden and feeding baby alpacas are included as well as all meals. Built completely of stone, mud bricks and thatch roofs, Colca Lodge is located in the heart of the Valley, on the right bank on the Colca River between the villages of Coporaque and Ichupampa. With a particular architectonic style inspired in the ancient Inca buildings, Colca Lodge combines an attractive rustic style with total comfort. All 48-room lodges have 24-hour hot water and electricity. With the aim of providing closer contact with the natural world, the hotel does not have television or other modern-world distractions. The lodge is especially charming for its natural hot springs, with small natural stone pools on the river shore that are available for hotel guests from the morning through the evening. Located in Chivay, usually the starting point for all tours in Colca, Pozo del Cielo has 20 cozy rooms decorated in rustic style. The hotel has been built with traditional elements of the Collagua Andean architecture, respecting the natural enviroment of the area. With privileged views of Chivay and the Colca Valley, the hotel has a restaurant with an excellent novo-Andean carte, based on the local culinary tradition and the usage of native ingredients. 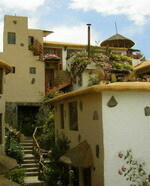 This rustic lodge is in the town of Coporaque, in one of the most picturesque and beautiful areas in the Colca Valley. Located very close to the famous “amphitheatre”, it offers incomparable views of the Colca Valley from its dining room. Built with materials of the area, the hotel has 20 cozy, rustic-style rooms and a very friendly staff. Belonging to the Casa Andina chain, Casa Andina Colca Hotel lies in the center of the colonial town of Chivay. The lodge is nice and cozy and ensures the excellent standard of service of this reliable hotel group. The 52 comfortable, rustic rooms are located in small pavillions surrounded by little gardens and are equipped with private bathroom, heating, and feathers comforter. Non-smoking rooms are also available. The hotel has a Planetarium and Observatory offering the daily show "Colca: Deep Canyon, Deep sky", in which guests can learn about Southern Hemisphere constellations, taking advantage of the exceptionally clear Colca Valley sky. The Kuntur Wassi hotel is a beautiful tourist resort, with 24 lovely, cozy rooms, a very friendly staff and an excellent service. Located in the core of the Colca Canyon, in the village of Cabanaconde, cradle of Inca and pre-Inca ancestral cultures, Kuntur Wassi is the first 3-star category hotel in this sector of the canyon. Its location is excellent to start the tour of the Colca’s attractions, being only 15 minutes by road from the natural viewpoint of “La Cruz del Cóndor” (Condor’s Cross), a compulsory stop for the visitors, and at the starting point for all adventure trips such as rafting in the Colca River and various trekking routes. Small but comfortable hotel with a friendly staff. It has 19 cozy rooms with private bathroom and hot water and is located in the typical town of Yanque, 7 km from the town of Chivay in the Colca Valley.